Perfect photo for "Hay should make up the majority of an adult rabbit's diet". 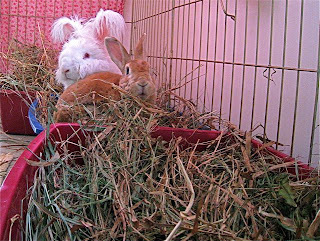 Or "Hay is the wide base of the bunny food pyramid" or, Sydney's favorite "Plenty of hay is good for the figure and the digestion." Wow!! they look so 'at home'!